Photo book providers compete for customer attention. Anyone wanting to create a photo book can pick from a rich variety of offerings, driven forward by constant innovation within the field. The leading photobook printers offer a range of different paper types including the choice between a standard, matte and high-gloss finish. This diversity is useful because the right choice of material will optimise the presentation of your pictures. This article describes the characteristics of the paper types and finishes on offer and guides you in making the best choice for your photo book project. Digital printing is the most popular choice for several reasons. Virtually all photo book providers have had the necessary Kodak Nexpress or HP Indigo printing equipment for years. The pages are standard and familiar, since every modern consumer has seen digital print products before. When printed at 200 dpi or better, the printing dots are not usually visible to the untrained eye, so only experts are bothered by the optical “noise”, making digital printing suitable for everyday photographs. Most photo books use a paper quality of about 200 g/m², while leaflets and smaller photo books often use a lower grammage of 150 g / m² or less. A stronger paper is necessary for the larger photo books in landscape format, which are popular as wedding albums. A good photo book provider will print larger photo books on paper up to 250 g/m². The digitally printed pages are bound with a spiral, or glued into the spine clasp to form a book. Leading photo book providers offer to refine the photo book pages with a glossy or matte finish, for which most photo labs demand a surcharge. Digitally printed glossy photo books receive a coating, enhancing the colours and brilliance. In addition, the gloss coating increases the durability, as it protects the photo book pages from moisture and dirt. To create a photobook as a gift where superior quality and appearance are expected, a high-gloss finish should be added, to emphasise the photo album’s value. Digital printing with a matte finish is ideal for photo books when using high resolution pictures, especially from SLR cameras. For this process the image data will be applied with high resolution ink on special paper. The special paper, together with the high-resolution ink, creates a photo book where the pictures can be rich in detail, with softer colours and superb contrast. The matting adds expression and character to the pictures, the reason why a matte finish is particularly popular among professional photographers. The special photographic paper for photo books developed by Fuji Film, is glued together back to back and then bound with a Leporello-binding. This lay-flat binding makes it possible for the photo book pages to lie practically flat, with no page curve. One advantage of photo books on photographic paper is that landscape pictures can extend over double-page spreads, gutter free. When choosing glossy photographic paper, the silver halide method provides, in addition to greater detail, high depth of field and a wealth of contrast, also a special colour luminosity. The images on the photo book pages appear in vivid colours. When printing a photo book on photographic paper, the image data will be processed like traditional photographic prints. The silver halide process provides great detail and intense focus with vibrant colours. Fingerprints can be easily wiped off the surface. The ideal holiday picture of a bright sunny day or beach appears more “vivid” in a glossy than in a matte finish. For superior luminosity we recommend using a glossy finish for holiday albums. For digital printing, the glossy coating provides more brightness and contrast. Better yet is real photographic paper, because with processed photo paper, the lack of dots provides smoother images with richer detail. The lay-flat binding with no page bulge is ideal for double-page spread landscape pictures. To maximise the detail in landscape and nature photography, the use of real photographic paper photo books is recommended, this avoids flickery print dots. To avoid reflections and exaggerated colouring, the best choice is to use a silk-matte finish. The lay-flat binding used for photographic paper results in landscapes over double-page spreads without a gap or book-bulge. Nothing displays skin as clearly and naturally as real photographic paper. Faces look more lively with a glossy finish. Examples of standard and matte finish. A format which is very popular for wedding albums is the large photo book with a leather or linen binding from Albelli, Photobox or CEWE; these are printed digitally. However, nothing depicts skin tones as naturally and realistically as real photographic paper. On glossy photo paper faces appear brighter and details sharper. 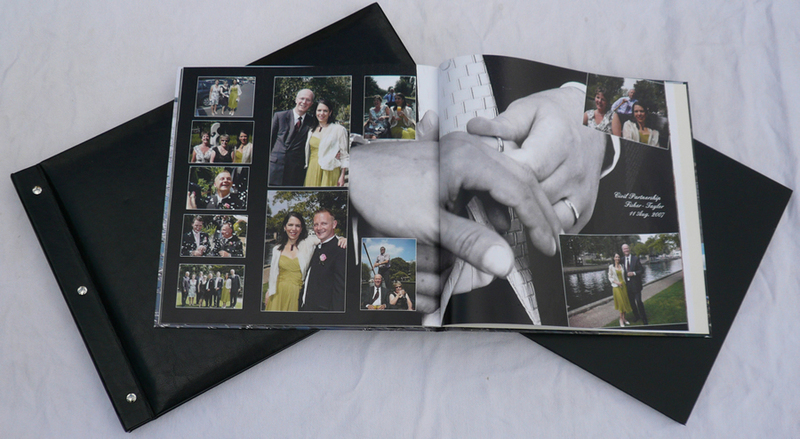 The stronger photographic paper, where the pages lie flat side by side is our favourite format for a wedding photo book. The glossy coating protects the pages in digitally printed photo books. It makes them ideal for the next generation’s first images, because the photo book will shine in vibrant colours forever. Nothing, however, reproduces skin tones as clearly and naturally as real photographic paper. On glossy photographic paper, faces appear brighter and with neater detail. The stronger photographic paper with pages lying flat side by side, is also our favourite for the baby album. Photographic Paper reproduces pictures without visible print dots and should be used to display highly detailed images. For a product catalogue, the choice is between the superior detail offered by real photographic paper or the more economical digital print. Pictures of animals, particularly when taken with a strong optical zoom, benefit from the improved contrast of the glossy finish. Photo books are fantastic memories: Whether of early childhood, a wedding album, a children’s scrapbook, a memory book as a birthday present or a holiday album. With the right choice of materials, going through personal photo books and viewing the pictures is great fun for life, no matter at what age.